Every Sprint starts with a Sprint Planning. Like every role has an accountability in Scrum, every event is an opportunity to inspect and adapt for the Scrum Team. Sprint Planning is the event where the Scrum Team collaborates to inspect the Product Backlog and adapt the Sprint Backlog. 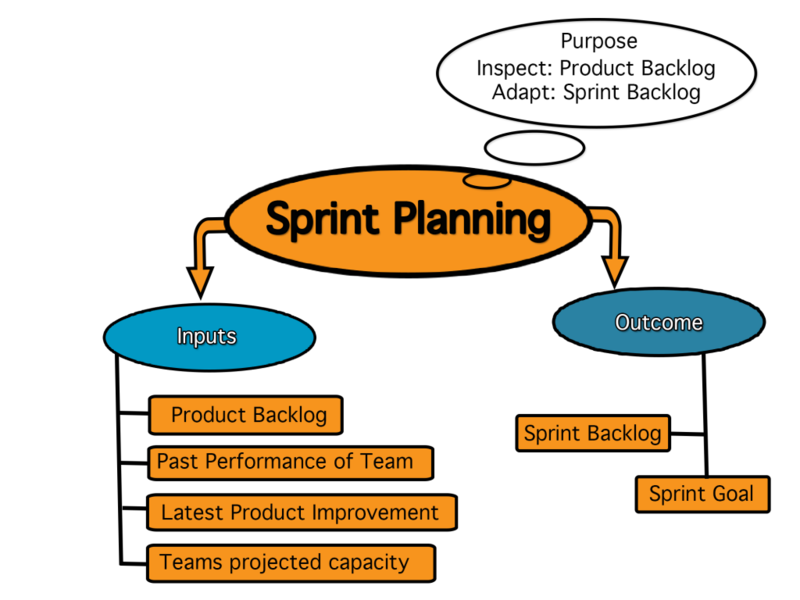 The purpose of a Sprint Planning is to inspect the Product Backlog and adapt the Sprint Backlog. It is a time-boxed event; time-boxed to a maximum of 8 hours for one month Sprint. Usually, for shorter sprints it is shorter. This, however does not mean that the Sprint Planning event is made shorter, proportionally, with the sprint length. Scrum Guide provides a guideline for the maximum duration. That means, irrespective of the Sprint length the maximum time a Scrum Team spends in Sprint Planning is 8 hours. The team may meet the purpose of the event in two hours and decide to end it, they do not have to consume all the eight hours. What can be done during the sprint? How the work chosen for the sprint will get done? The inputs to the Sprint Planning event include – product backlog, latest product increment, projected capacity of the team for the sprint and past performance of the team. The Scrum Team also formulates a Sprint Goal during Sprint Planning. The Sprint Goal acts as a guiding principle as to why the Development Team is building the functionality. It also provides some flexibility to the Development Team around the functionality to be implemented. The Development Team may invite people from outside of the Scrum Team to attend the Sprint Planning in case they need some insights from the subject matter experts on the technology or business domain. The Sprint Planning event is an eight hour time-boxed event where in the Scrum Team collaborates to inspect the Product Backlog and adapt the Sprint Backlog. The event starts with assessing the ordered Product Backlog items. By the end of the event a set of Product Backlog items is selected and a plan is devised about how the Product Backlog items will be converted to “Done” product increment. Scrum, Scrum Events, Sprint, sprint goal, Sprint Planning. Bookmark.